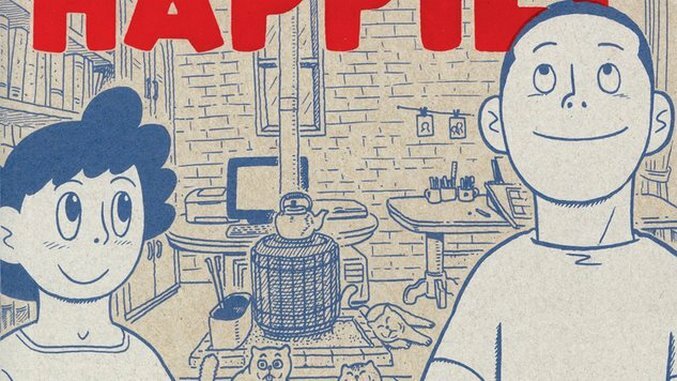 The cover of Uncomfortably Happily presents an idyllic scene: a smiling, healthy couple, holding hands, with three cozy cats, a warm stove, two clean work surfaces and a shelf full of books in the background. An ungenerous appraisal would call it false advertising, for within lies a tale of woe, adversity and neurosis. Are the setbacks overcome? Sort of… The back cover begins, “A place without traffic noise, where the night is as dark as possible, secluded yet spacious, with actual room to walk…” which is exactly what Yeon-sik and his wife, Sohmi Lee, are looking for when they decide to move to a cabin on a mountain outside of a remote rural town. They’re in love with the romance of country life—and too poor for the city. What follows isn’t exactly a disillusionment, but it’s not quite #vanlife either. They freeze, they can’t afford charcoal for their stove, they can barely buy food, cab drivers refuse to drive up the mountain (they don’t have a car, so they have to walk and take the bus a lot), clearing land and removing rocks to create a suitable garden is back-breaking work, hikers and nature tourists invade their space and leave garbage everywhere and Yeon-sik has a terrible relationship with his editor, with whom he corresponds by phone. Poverty only seems noble when you haven’t been ensnared in it a long time or when you’ve moved long since past it. When you’re in the thick of it, it’s mostly misery, especially if your health starts to go, which is exactly what happens. Thank goodness Hong has a drawing style one could fairly call bubbly. It’s not quite as stripped down as John Porcellino’s work, but it’s similar in its ingenuousness. People’s faces are round and open, with emotions that positively romp across them. Metaphors are often embodied; pages that address joy are sweet and genuine, but those pages are outnumbered by the ones that radiate stress. As Yeon-sik and his editor wrangle over pages that need to be redrawn from his work for hire, he complains for panel after panel after panel, harshly criticizing his wife’s drawings and daydreaming about buying a car instead of focusing on finishing what would actually get him paid. Sure, it’s an unflinching self-portrait, and that deserves some credit, but it’s also difficult to endure for 572 pages, trapped in a tiny house with no other characters. It’s a wise idea to take breaks from the reading experience, lest you throw the book across the room. That said, it is worth reading. Hong’s drawings are beautiful and interesting, and there’s something successful about the melancholy tempered with realism that Uncomfortable Happily conveys. Living on a mountain isn’t all it’s cracked up to be, but neither is living anywhere else.